Sport Tornado Foosball Table | Fun! 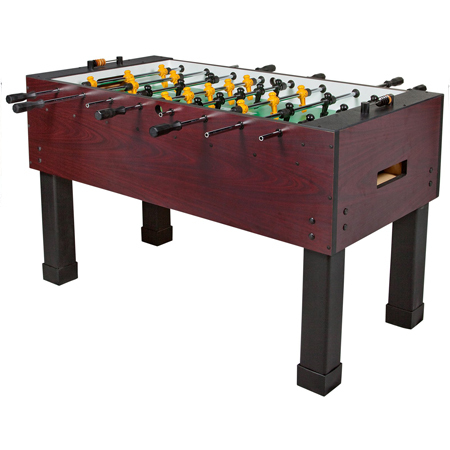 The Sport foosball table model is a new 2010 model that replaced the Whirlwind foosball table. The Tornado Sport is a good table for starters and people who are looking for all of the right bones to learn the game. This table lacks some of the higher-end quality parts that some of the other Tornado tables offer like counterbalanced men, thicker cabinet construction, adjustable leg levelers to easily level the table, and wooden handles. However, included is the new Tornado redesigned player foot which allows more precise ball control with higher cross hatching and square sides. A new thinner inner bearing design does not allow the ball to be passed between the man and the wall. Patented rubber bumper player and rod guarantee super-fast durable play. One unique feature of this Sport table is the ability to adjust the height to two different settings for younger players.